AAA Texas encourages families to have a conversation about the dangers of distracted driving. This is especially crucial for families with young teen drivers, whose risk of being involved in a crash is already increased due to lack of experience behind the wheel. Recent statistics released by TxDOT show year-to-year improvements in some Texas counties from 2016 to 2017, but also show distracted driving deaths are on the rise in the Dallas and Houston areas. Major counties such as Dallas, Harris and Travis experienced spikes in the number of fatal distracted driving crashes from 2016 to 2017, while other counties like Bexar experienced a decrease. However, Bexar County saw the greatest number of fatal crashes in the state, totaling 45. Bexar County also had the most total number of distracted driving crashes in the state with 24,021. However, the total crash figure in Bexar County is down from 26,313 in 2016. The statewide total number of fatal distracted driving crashes also decreased year-to-year from 417 in 2016 to 403 in 2017, according to TxDOT. Don’t be a distraction.Avoid calling or texting others when you know they are driving. Distracted driving not only comes with deadly consequences, but is also illegal in Texas. Starting September 1, 2017, drivers could face citations and fines if found guilty of texting while driving. 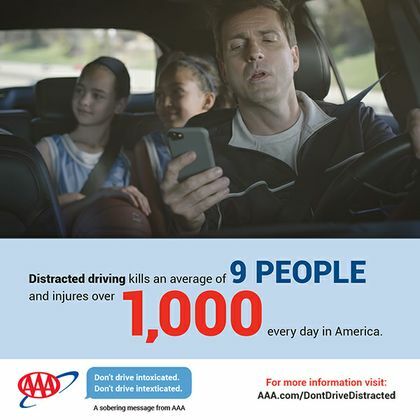 For more information visit AAA.com/DontDriveDistracted. For the television PSA click here, and for b-roll of the making of the PSA, click here. (Password for both: Intexticated). AAA Texas branch offices throughout the state can be found by visiting www.AAA.com. Follow AAA Texas on Twitter: @AAATexas and Facebook: www.facebook.com/AAATexas. Find additional news from AAA Texas in our online newsroom at http://tx-aaa.iprsoftware.com/.